Melissa Manchester established herself as a leading songwriter and female pop/rock vocalist in the 1970s. Her early work included such hits as “Midnight Blue” and “Whenever I Call You “Friend”” (co-written with Kenny Loggins). By the dawn of the CD era, Manchester was still a household name, turning out hits like “You Should Hear How She Talks About You” and “Don’t Cry Out Loud”. 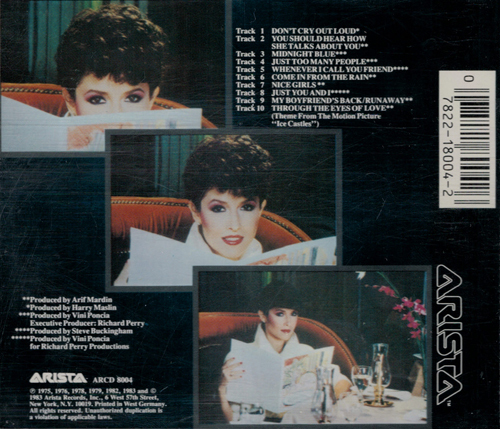 Not surprisingly, Manchester’s label, Arista, chose to further capitalize on her success by getting her work out on CD early. Her 1983 compilation, the 10-track Greatest Hits, was one of the first titles released by Arista on CD in the U.S. As such, it bears an early Arista catalog number, ARCD 8004. Aside from myriad U.S. pressings that hit the shelves over the years, Greatest Hits was released as a Japanese Denon pressing early on. The inserts with this Japanese pressing were printed in the U.S., which is typical for early Arista releases. Although said Denon pressing is a noteworthy collectible from those early days, we highlight here a West German Polygram pressing of Greatest Hits. In my experience, this West German pressing is rarer than the Japanese pressing. A unique feature of this rare pressing is that the accompanying inserts were printed in West Germany, not the U.S. This could mean that the West German Polygram pressing was the first release of Greatest Hits. As a Polygram pressing, the disc has aluminum running to the center hole rather than a clear plastic ring at the center. The matrix code is “ARCD 8004 2893 367 02”. Shown below are the front and back inserts for the West German Polygram pressing of Greatest Hits, along with the disc. The front cover for the West German pressing of Melissa Manchester Greatest Hits (Arista, catalog number ARCD 8004). This is the standard cover artwork for this compilation. The back insert for the West German pressing of Melissa Manchester Greatest Hits (Arista, catalog number ARCD 8004). As noted in the lower left corner, this insert was printed in West Germany. Inserts for early U.S. Arista releases were typically printed in the U.S. The West German Polygram pressing of Melissa Manchester Greatest Hits (Arista, catalog number ARCD 8004). Instead of a clear plastic ring at the center, this disc shows the typical Polygram plant feature of aluminum running to the center hole. Note that the disc states “Manufactured in West Germany for Arista Records…” at 3 o’clock. The matrix code is “ARCD 8004 2893 367 02”.